Home Uncategorized Featured Articles Did you hear the one about the Sligo man? Did you hear the one about the Sligo man? Niamh Marron, comedian and Sligo Weekender Columnist speaks to fellow comedian and Sligoman John, Cleary, and looks forward to two weekends of laughter. 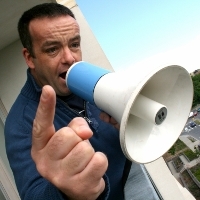 COMEDY: Sligo stand-up John Colleary. You may know him from RTE TV shows such as ‘The Savage Eye’, ‘Irish Pictorial Weekly’, ‘Hey Ho Let’s Go’ or acting the maggot as a young lad in school. Either way, anyone who knows John Colleary knows he’s one of the most genuine men you will meet and just happens to be a natural born comedian to boot. When a comedian gets a gig somewhere around Ireland the first thing they want to know is – how much is it paid and who else is on? Comics tend to travel together and get a lift from whoever is driving down and this tends to be the best crack of the night for the comics. It is five years ago now, during one of those journeys, that I really got to know John. He loves to answer questions in different characters and makes the most mundane things silly. You really can’t help but laugh because you know people exactly like those he is impersonating. His characters are universal to one and all. One of the best things about this genius comedian is that he works so hard in comedy yet makes it look effortless on stage. He always has ‘the head down’ gigging all over Ireland trying out new material. Never for a second would he let all his success go to his head. John is a genuine, kind and modest person. He has the love and respect of every comedian on the Irish circuit, because he is one of the most talented comics there is out there. I met up with John to ask him a few questions for all you good people of Sligo, who may have grew up with him, kissed him or knew his family. What was the first thing you remember wanting to be when you grew up &amp; why? When do you get sick of people asking you to do impressions? What do you think is the hardest and easiest thing about being a comedian? For Niamh’s full chat with John pick up this week’s Sligo Weekender- in shops now.